Home | Vinyl Siding Cost | Why Are Fiber Cement Prices Higher? There are many types of exterior siding products to consider for your home if the old siding is beginning to look dated and beyond hope. If you like the look of wood siding but want to know about other options, you should consider two popular alternatives--vinyl siding and fiber cement siding. Vinyl siding and fiber cement siding both offer varieties with the appearance of wood and each should require much less maintenance than wood siding does, but why are fiber cement prices higher, and is it worth the extra cost? 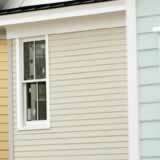 Wood, vinyl, and fiber cement siding are all great exterior siding products and each has its strengths and weaknesses. When you compare fiber cement prices to those of vinyl or wood siding, in many cases they're higher; however, you may get a better comparison by looking at brick and stucco pricing. Fiber cement siding has the appearance of wood siding, but it has the durability of brick and stucco and costs less than either of those products. If you choose a pre-finished color of fiber cement siding, such as those offered by CertainTeed or JamesHardie, you may never have to do a bit more maintenance than you would on a brick or stucco sided home. Fiber cement prices may be a little higher, but when you realize it has the same durable qualities that brick or stucco siding have, it can seem like a bargain.